If you’re heading for an evening at the cinema soon, one of the choices on offer is The Railway Man, the latest film starring award-winners Colin Firth and Nicole Kidman, and featuring a screenplay written by friend and patron of The Reader Organisation Frank Cottrell Boyce (Frank even recorded a reading of the opening of his book Cosmic for TRO while on the set of The Railway Man’s filming – very glamorous). The film has been in the Top 10 of the UK Box Office list since its release, and the book of the same name on which it is based has rocketed to the upper ends of many bestseller charts. The Railway Man is the autobiography of Eric Lomax, a British Army officer hailing from Edinburgh who was captured and held as a prisoner of war in Japan after the Battle of Singapore as part of World War II in 1942. During a period of torture in a series of prisons, he was taken to Kanchanaburi in Thailand and forced to work on building the Burma Railway – ironically, given that as a boy he was passionately and incurably interested in trains. 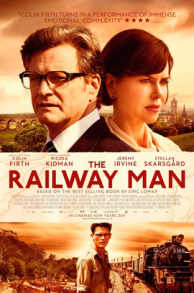 The Railway Man tells of the consequences that came from his secret construction of a radio and a map during WWII, the emotional and psychological damage that lasted forty years since his release and an eventual meeting and reconcilation with the focus of his pent-up anger, the man who acted as interpreter during his torture. A truly extraordinary story of the capacity of humanity to overcome the worst, it is little wonder that it was chosen to be adapted for the big screen. Reading made all the difference to our prospects of survival. There were a lot of individuals, as in any walk of life, who never read a book from one year to another. They had difficulty in surviving but anyone who had access to reasonable quality books could keep occupied for hours. The instinct for survival was the strongest aspect at work in Eric’s mind throughout his time of imprisonment, but he did have informal discussions and trade notes on books with fellow prisoners, and reading as well as writing about his own life served to enrich and stretch a mind that could have very well been diminished by such traumatic experiences otherwise. Previous Previous post: Half Term Hijinks is back!